Sometimes, when shopping at the co-op, I have a bad habit of scooping up some item that is not on my shopping list, simply because it’s pretty (or because I’m hungry). This has happened with loaves of Breadfarm bread, gorgeous French cheeses, bunches of baby beets, and heirloom tomatoes – despite the fact that I have no menu plan for them and I have to haul them up the hill along with everything else I’m buying that day. 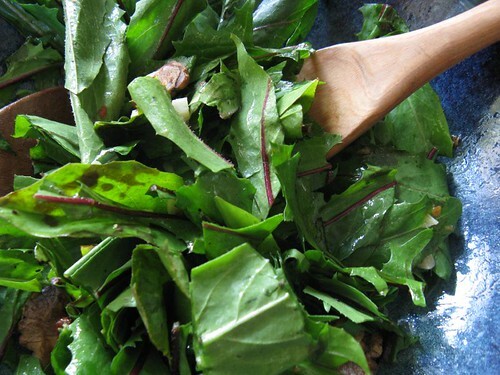 This time I fell for a bunch of red dandelion greens: they were in big fat fresh bundles and looked so springy, it didn’t matter that I had no idea what to do with them. I went home and rifled through a number of cookbooks, particularly anything by Alice Waters or Deborah Madison, and came up with a few possibilities of what one should do with dandelion. While the salmon was roasting (not Copper River, but from somewhere nearby – almost as expensive) I tore up the greens and washed them – a really impressive amount of dirt came off. I heated a small cast iron pan and put in a few chopped-up garlic cloves, a pinch of red chile flakes and the last two anchovies in the house. 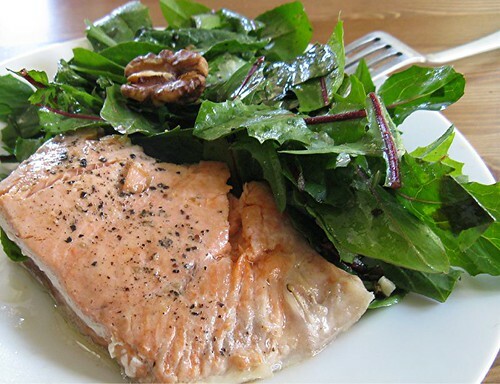 When those had sizzled for a minute I added a good glug of olive oil, and when that was hot I gave it a splash of red wine vinegar and poured the whole panful over the bowl of dandelion greens. The heat wilted them a little, but they seemed to be pretty tough and mostly stayed crisp. I added a few toasted walnuts as well (a suggestion from Vegetarian Cooking for Everyone). Served alongside the buttery salmon and a glass of Hedges rosé that was insanely discounted at the store, the greens were very good: extremely bitter, but definitely complimented by the garlic and anchovies. The walnuts were good, but I wished I’d actually oiled and seasoned them like the book said (I can be stupid that way). Because of the firmness of the greens, I would probably braise them next time, but this made for a perky, virtuous-feeling dinner. 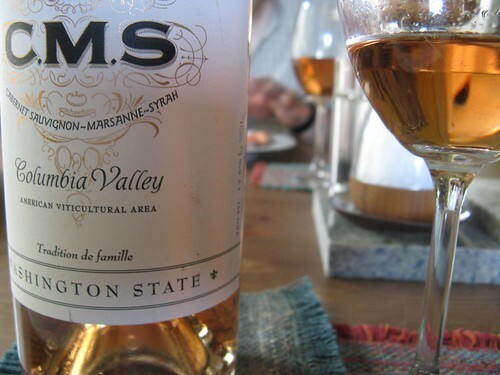 The last time I fell off a horse (30 years past… maybe more), I had a belly full of homemade dandelion hooch (I’m still unable to call it wine) swishing about. Even after such time passing, I can reasonable say your presentation is far more palatable than the one I had.